It’s been a while from my last posting. The laptop which I normally use failed. I am trying to catch up slowly. As mentioned in “Abudhabi-1 “, I stayed in Abu Dhabi from October 22. 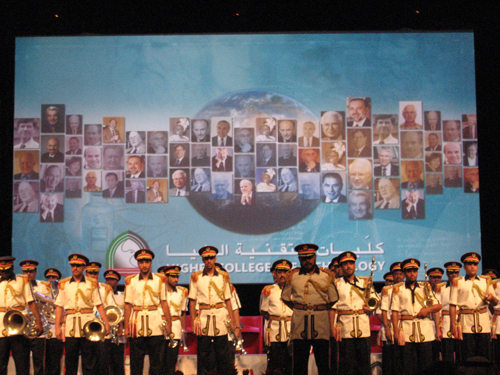 The Festival of Thinkers started with a opening ceremony and then there were various excellent programs. I will introduce to you some related sites. They supplement contents of this blog. New York Social Diary　（1, 2）　Lots of wonderful photographs which include myself are posted. In the opening and the morning special lecture, Ms. Maathai of Kenya who won the Nobel Peace Prize of Year 2004 gave a speech which shook everybody’s heart. This was after winning the Nobel prize, when she visited Japan during the tenure of Prime Minister Koizumi, she was moved with the Japanese word “mottainai – wasteful" and have been spreading this word across the world. My photograph (photograph 1) was also on the rear screen of the stage in the opening ceremony. I was happy to see this. Photograph 1 Opening ceremony. Can you see my photograph? 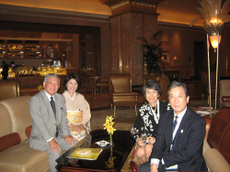 Dr. Ishikura, myself and President of the Asia Pacific University APU sponsored by the Oita Ritsumeikan University Dr. Cassim participated in the Panel related to Japan named as Theme 7 “The Rising from the Ashes－Japan special”. 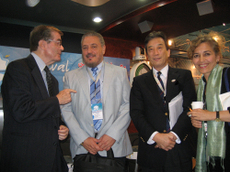 The purpose and contents of this panel as it appears in the program pamphlet of the Festival of Thinkers were written by Dr. Azimi, the Director of UNITAR Hiroshima. It was a very good writing. She was also a Keynote speaker. This session included greetings by Ambassador Hatano and Dr.Cassim. Professor Sasaki gave a demonstration of flower arrangement and Mr. Ikenobo talked about the form and mind behind flower arrangement of the Ikenobo school. 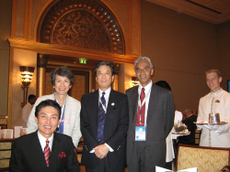 Later, a panel was conducted wherein Dr. Cassim, Dr. Azimi, Dr. Ishikura and myself participated. The blog which I have mentioned earlier includes the description of this panel. Then, I also participated in the panel that was conducted later Theme 8 “Moving Beyond Conflicts”, check the program site for the contents. Seated on my right side was the son of President Castro of Cuba, his name also Fidel Castro, a physicist who was educated in the former Soviet Union and a scientific advisor of the President. I had met him around 4 years back in the United Nations University and we met again after a long period.An American panelist was seated at the left end. In his self introduction, he said “I have a poor vision and it is inconvenient while walking, but I have a vision which is clearer than the present President of the United States of America". After this panel was over, I discovered that this was Theodore ‘Ted’ Sorensen who wrote the main speech for late President John F Kennedy and who was also the advisor for JFK (he was only 31 years old in 1961 when JFK became the President and he participated in the advisor committee) and was the most trusted. He did not reveal his current status and briefly touched upon that the day before was the 45th year anniversary of the “13 th day” of the missile crisis in Cuba that continued for 13 days from 15 th October 1962, the crisis that nearly touched the nuclear war “in the Cold War” (there is also a film named “Thirteen Days"). He has also interviews and commentary regarding the above. What do you think about him? Isn’t he a great person? The panel was over and during Q&A session, one person said "He is the person whom I wanted to meet the most, the advisor of JFK who saved a nuclear war which might have occurred in the Cold War, the person who wrote for JFK. Ted Sorensen". And everybody was surprised. Through those words, not only me but everybody felt his respect towards JFK. In the blog which I introduced earlier, articles about this panel by Ted Sorensen and Mr. Castro are given (my "Proud Moment” with the panel is also seen). It was an unexpected pleasant experience . I thank everybody in Abu Dhabi for their cooperation and help. By the way, after a few days when I returned to my country on finishing the meeting in Beijing, Mr. Castro and Cuba Embassy Officer visited my office and met Dr. Teruo Kishi, President of NIMS (National Institute for Material Science) and Satoru Tomita at the Riken, regarding the nature of Nanotech study. This is a practice of what I always say "Science as a Foreign Policy". It is a powerful diplomacy.